With so many options of things to do, places to eat, stay and play in Santa Fe, travelers often ask me for some itinerary ideas to help them make the most of their often limited time here. Three days is a very popular vacation duration for many travelers. I’ve put together a sample itinerary for three days in Santa Fe to help you get an idea of the broad scope of things to do here. This particular itinerary offers a variety of interests from history, food culture, and art to outdoor adventures. If your tastes vary, you can also reference SantaFeSelection.com Travel Guide for more ideas that will pique your specific interests. First things first, you’ll want a map to orient you to the area. Send me an email with your name and mailing address to Maria@santafeselection.com and I will send you the best one. The Santa Fe Selection Mini Guide Maps piece offers three easy reference maps with ideas on where to eat, shop, play and more. It can be mailed to you free of charge (in the U.S.) in advance of your arrival. Or you can pick one up at most hotels, b+b’s and visitor centers once you’re in Santa Fe. 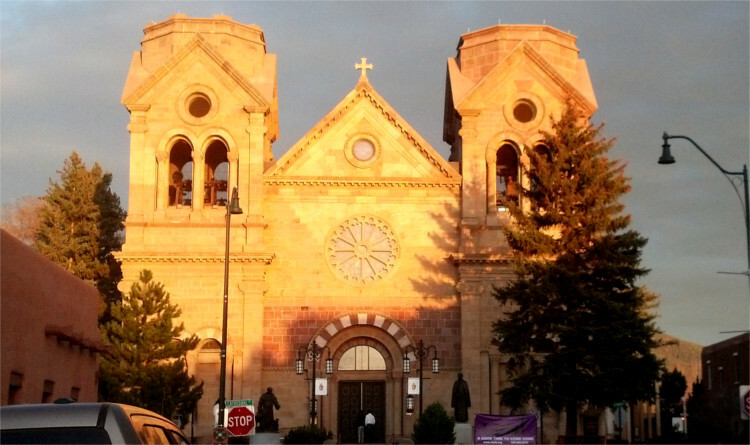 St. Francis Basilica near the Historic Santa Fe Plaza. This is one of the most frequently asked questions. 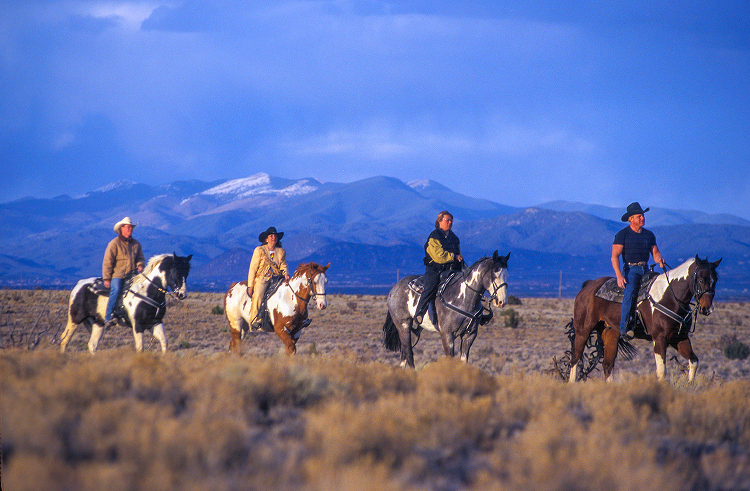 Santa Fe is a wonderful year-round destination for individuals, groups, and families. Named as one of the “Top 5 Destinations in the United States” by Travel + Leisure Magazine, there is a wide variety of things to do indoors and outside anytime of year. From immersing yourself in the arts, history, food and culture to outdoor adventures, hiking, biking, skiing, fishing, and more, in a wild and varied terrain. For the time of year to visit that would best suit your preferences, check my Weather and What To Pack article, which shows temperature ranges and offers insight into how to be best prepared for the four seasons in the high desert climes of Northern New Mexico. Check our Annual Events Category, which shows you the top events that you can plan for or around. Last but not least, use our Lodging category to find the best accommodation that suits your needs and budget. Among the many options, you’ll also find our top hotel recommendations in the downtown Plaza area offer special promo code discounts for Santa Fe Selection users. You can book directly with the hotel, vacation rental, b+b, etc., using the links provided. Three Days in Santa Fe Itinerary. This three-day itinerary is focusing on outdoor adventures with a dash of history and food culture. You can make adjustments according to your ability, preferences and energy level by checking out each complete listing provided with each referral link, and by going to SantaFeSelection.com Travel Guide. Most lodging locations have a 3pm check in time. Once you’ve checked in to your lodging, remember to get hydrated. Being in the high desert, you will need to drink a recommended two liters of water per day to stay hydrated. We are at an altitude of 7,000 feet. The air is some of the cleanest in the U.S., but a bit lighter in oxygen than at sea level. So take it easy and avoid drinking alcohol on your first night. It’s best to acclimatize before hitting the Margarita Trail. Enjoy a relaxing dinner at one of our favorite restaurants. See our recommendations in our Restaurants Category. After dinner, take a light stroll around the neighborhood and stir your curiosity about all the stories behind this 400+ year-old City Different. Day 2. Morning: Historic Walking Tour 9am – 10:30 /11am. Santa Fe is the oldest capital in the U.S., and is steeped in culture from Native American, Spanish, and Anglo traditions. After breakfast at your hotel or at The Plaza Café, or Mangiamo Pronto, meet up with an expert historian guide for a fascinating walking tour of the historic Plaza area. I recommend Tom Gallegos and his True New Mexico Tours. You’ll take an easy walk through time, learn of the wild and woolly characters, architecture, art and folk tales that make this city the unique character that it is. You’ll also make note of such iconic locations as The Loretto Chapel, Georgia O’Keeffe Museum, The New Mexico History Museum, the Oldest Church, and more, so you can visit later in more depth, if you wish. Duration: Tours are between 1.5 to 2 hours, or more, if customized to suit. Day 2: Lunch. Noon – 1pm. After you are oriented and acquainted with downtown, you’ll want a spot of lunch, and Casa Chimayo offers a great, down-home, authentic Norteño New Mexican lunch just a few blocks from the plaza. 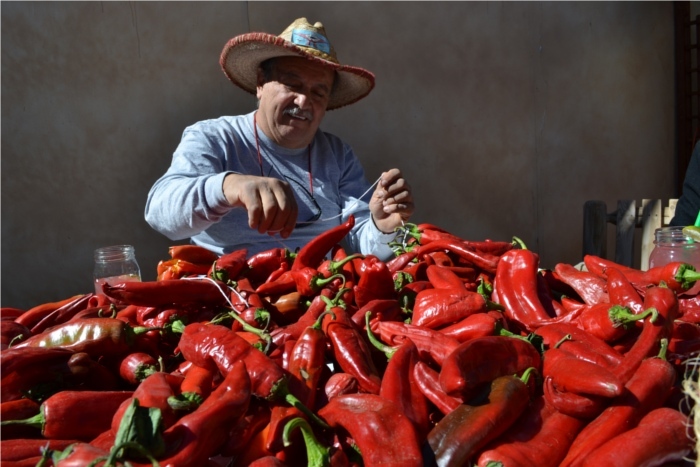 Enjoy New Mexico-grown chiles grown from the seeds of original Chiles de Caribe, brought over from Spain by owner Timoteo’s ancestors in the 1500s. Their chicken enchiladas were featured on Food Network’s Diners, Drive-ins and Dives, and try their posole and carne adovada, wine margaritas and more. The restaurant and its owners are wonderful New Mexican characters. See our Restaurants category for more options of conveniently located favorite restaurants. A mountain of freshly harvested chiles and Timoteo making ristras. Option #1: New Mexico is the Chile Capital of the World. After tasting some at lunch, take a fun hands-on chile (we spell it with an “e” not an “i”) workshop with Santa Fe School of Cooking. Learn about the history and techniques of the amazing food culture of New Mexico. Chile is more than an ingredient for New Mexicans; it is the embodiment of a diverse and rich cultural heritage and a distinct Southwestern lifestyle. You’ll learn the history of chiles and prepare flour tortillas, and a variety of unique southwestern sauces to spice up your kitchen when you get home. Click this link for their calendar of classes. Option #2: Another fun option would be to skip lunch and take Santa Fe’s #1 Food Tour with Wander New Mexico. Taste the delicious creations of foods with wines or spirits of a small group of top local Chefs. Eat and drink your way through the creative Railyard District, or Plaza area, or Canyon Road. Use the promo code mentioned in this link to get $10 off your tour. Day 2 Art World Afternoon. Option #1: If delving deeper into the art world is more to your liking, then you’ll want to take a tour up the famous Canyon Road with Santa Fe Art Tours. More than an art tour, it’s an immersive experience. You’ll explore a variety of art, and meet some of the gallery owners and artists that help make Santa Fe one of the top arts destinations in the U.S.
Dominique Toya – Jemez Pueblo demonstrating the making of a Seed Pot at Lyn A. Fox Gallery. Option #2: If you prefer to delve into your own inner artistic streak, I highly recommend taking a private art class with a professional artist. Get off the beaten track and try your hand at painting and mixed media arts with Lauren Mantecon’s Art Alchemy Studio. Lauren offers lots of fun with her mixed media and painting classes in her professional studio. 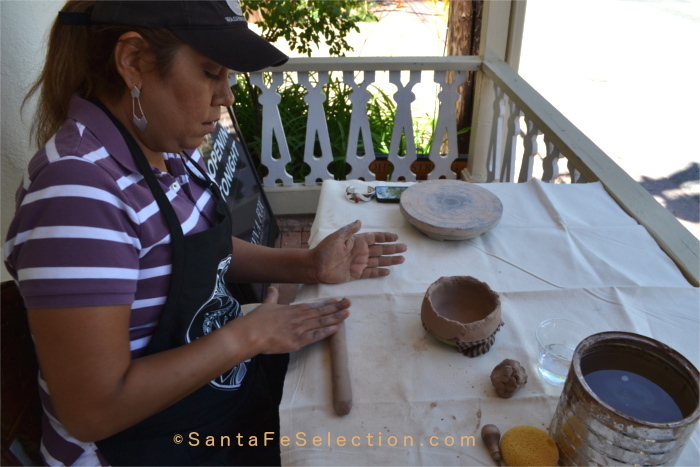 Or play in the mud, throwing pots, or hand-molding clay with Santa Fe Clay Play. Professional clay artist Ginny Zipperer will open her studio to you also, and help you learn and create with clay. Both activities will have you taking home your hand-made mementos of your creative experience in Santa Fe. Keep in mind no prior experience is required for hands-on art classes. Simply come with a curious mind and be prepared to have lots of fun ​making a​ mess! That should be enough to leave you feeling welcome and acquainted, and ready for a nap before dinner. Day 2. Dinner & Entertainment. 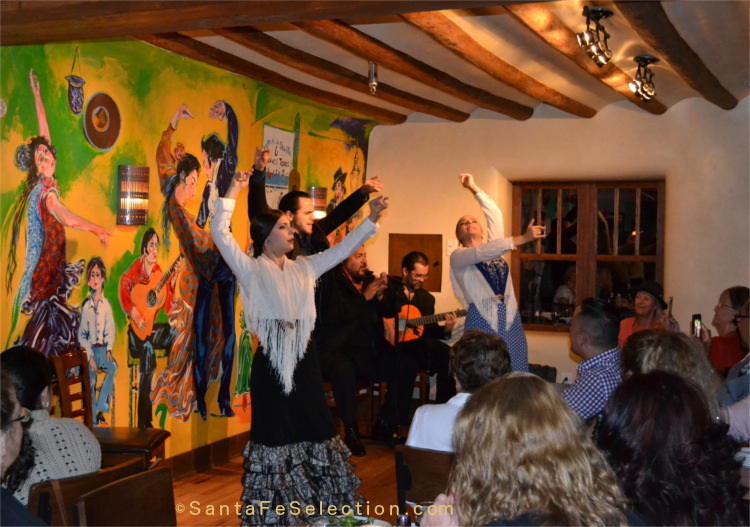 For a memorable dining and entertainment experience, I recommend you be sure to have booked a table in advance of your arrival in Santa Fe at El Farol for their Flamenco Dinner Show. Located at the top of historic Canyon Road, you’ll enjoy a light meal of authentic Spanish tapas or your choice of full entrees, followed by a world-class, passionate Flamenco performance in an intimate setting. Reminiscent of the original caves of Old Spain’s Granada. Olé!! You’ll arrive between 6.30pm and 7pm for your dinner service, and if you’re full from your afternoon, don’t worry, there are plenty of light tapas plates to choose from. The dinner service is followed by the Flamenco performance. If you prefer to go more casual, relax at any one of our favorite dining joints, such as The Cowgirl, where there is usually a live band in the evenings, or Del Charro Saloon, Café Sonder, The Teahouse, or Santa Fe Bar & Grill. Check more recommendations in our Restaurants Category for a style that suits your cravings. Day 3. Get into Nature. You will have adjusted to the 7,000 feet altitude by now, and be ready to get physical. Ranked #1 for Outdoor Activities by USA Today, and #1 for air quality by the American Lung Association — it’s time to get out into nature. Give yourself the day to devote to an adventure. Choose from any of the following activities for a half or full day’s fun. 8am – Noon: Half Day. Your outfitter will advise you on the timing for your particular outing. A nice catch with Jarrett of High Desert Angler. 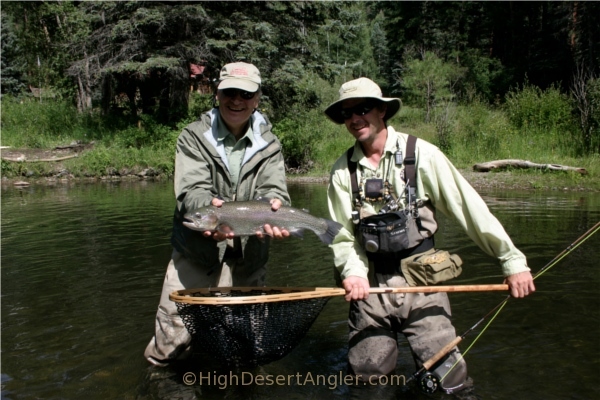 Fly fishing: With High Desert Angler’s expert guides you’ll have top-notch fishing any time of year, and private river access. It’s fun for novices and experts, families with kids, and friends. Whatever your skill level, you’ll enjoy this wonderful journey to Northern New Mexico’s beauty and serenity. Take a 6×6 Pinzgauer Tour with Santa Fe Mountain Adventures. They’ll whisk you away to historic cliff dwellings, petroglyphs and present day Native American pueblos, and introduce you to ancient cultures, wild horses, and buffalo. Or you could take a mountain biking or hiking tour and skirt the cliffs of the Santa Fe River valley. In the winter you can snowshoe, or cross-country ski when the snow blanket is nice and thick. Santa Fe Western Adventures heading out on a ride. Horseback riding along the foot of the Ortiz Mountain Range is reminiscent of those old spaghetti westerns. It conjures up visions of The Duke, John Wayne, trekking on horseback over plains and buttes with amazing mountain ranges in the background. You can do all that with Santa Fe Western Adventures. And your guide is likely someone you may recognize from their appearances on such television shows as Breaking Bad, Longmire and Manhattan. Ride the River: From March to late September, New Mexico River Adventures offers a variety of fun tours for all ages and ability levels. (Use promo code: santafeselection for 10% off your booking). Floats, whitewater rafting, paddle-boarding, you name it, they will outfit you for it. 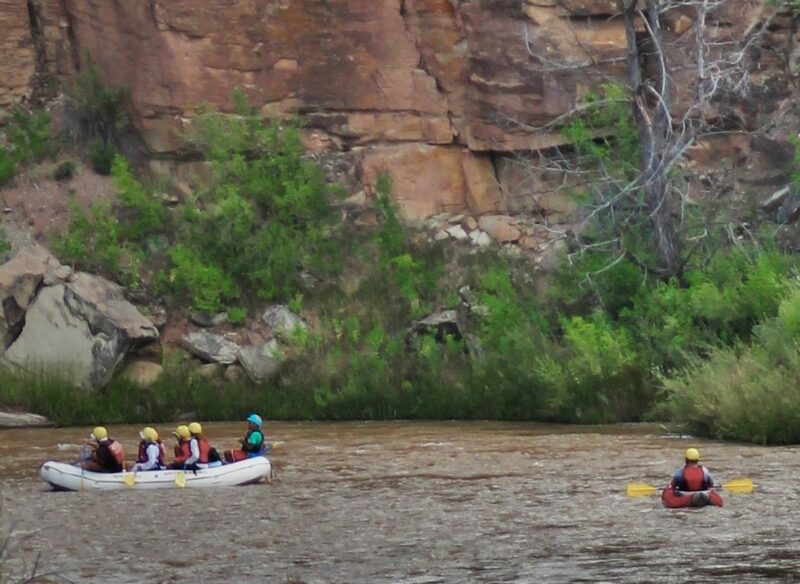 Discover the beauty and nature of the Rio Grande, or the Rio Chama. Enjoy a half-day ride followed by a picnic and then relax into a fun wine tour to nearby boutique wineries. (This particular outing is booked through New Mexico Wine & Scenic Tours.) Be sure to mention Santa Fe Selection. Take a scenic driving tour through the oldest wine country in the U.S. with New Mexico Wine & Scenic Tours. Owner Cindy, will pick you up at your hotel and do all the driving, so you can enjoy the scenery and flavors of boutique award-winning wineries between Santa Fe and Taos. Did you know New Mexico is the oldest wine country in the U.S.? Yes, older than California’s. Take a couple of hours to relax with a rose petal bath, or a massage, and facial at Absolute Nirvana. Day 3 Afternoon: Relax and Rejuvenate. If you’re on any of the half-day outings you’ll likely set off by 8:30 or 9 am and be back at your lodging by noon – 1 pm, which gives you time to grab a nice lunch at one of our favorite restaurants then take some time to shop for gifts on or around the plaza, and railyard areas. Our Unique Shopping category and Mini Guide Map will help you plot your shopping spree. 3pm – 5pm: Enjoy an early evening relaxation and indulgence session with a spa treatment at Absolute Nirvana. The word “Nirvana” is Sanskrit for a place or condition of sublime happiness and fulfillment. Absolute Nirvana is a wonderful boutique spa, nestled in a cozy Victorian building just a few blocks from the plaza. Enjoy a Rose Petal Bath, and any of a variety of wonderful facials or massages using all organic botanicals. If you took a full day excursion, you’ll likely be back by 4 or 5 pm, which gives you time to freshen up before dinner. 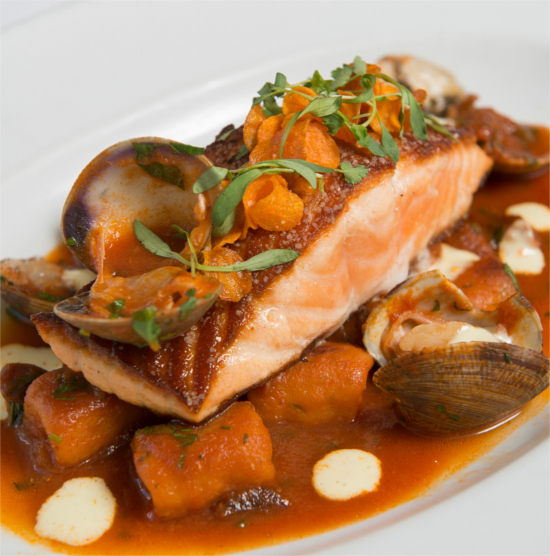 For a finale for your last night in Santa Fe, book in at one of the top restaurants boasting award winning chefs. I highly recommend The Compound on Canyon Road, Il Piatto Italian Farmhouse near the Plaza, Joseph’s Culinary Pub near the Railyard and close to the Plaza, or Blue Heron, which is about 20 minutes drive on the original El Camino Real. Reservations are strongly recommended at all locations. If you’re with very young children, I recommend keeping it casual at La Choza, Del Charro, The Shed, The Famous Plaza Cafe, Casa Chimayo, Santa Fe Bar & Grill, or Cowgirl. At Cowgirl the kids can play on the jungle gym outside, while the grown-ups taste the favorites from the Margarita Trail, or choose from a menu of 24 craft beers at the bar. Departure Day: If your flight doesn’t leave Albuquerque airport until 3pm or later, or Santa Fe airport until 2pm or later, you’ll have time to enjoy a brunch or lunch before you go. Midtown Bistro offers delicious lunch and weekend brunch. It’s off the beaten path in the Midtown Innovation District, only 1.7 miles from the historic plaza. It’s a local fave for daily lunch, weekend brunch and dinner. That’s just a starter for ideas for your three days in Santa Fe. There’s so much more to explore! Three days isn’t enough time to get the full experience of this area. If you’re thinking of coming to Santa Fe, I would recommend trying to schedule in at least four or five days so that you can enjoy an easy pace and have a wider variety of experiences. But if needs must and three days is all you have, you can still gather a portfolio of fantastic memories. But I’m pretty certain you’ll want to come back again to get the full range and true authentic flavor of this unique destination. Enjoy your stay in Santa Fe! !